We are in the throes of practicing our basic domestic survival skills, as our vacuum cleaner died right before Christmas, and dishwasher died on Christmas Day. What are the chances? I have learned that a family of seven makes a lot of dirty dishes, enough that the counter can be completely covered between official meals. Fortunately, most of the children have had a good attitude about pitching in. Usually one child has dish duty at dinner time, but they have each been taking a turn and doing a fourth of the dinner dishes--there are so many! New dishwasher is due first thing Saturday morning. As for the floors, the Composer is v. handy with a broom. And our new vacuum came by UPS today. Tomorrow we will be clean again. While attempting to pin darts into the back of a blouse I was wearing (not successful), I decided the time had come for a dress form that actually replicates my figure. True, I have Lucille and am very grateful for her. She's a dial-up dress form and great for holding a dress or skirt for hemming, buttons, setting sleeves, etc. But even when I match her bust, waist, and hip measurements to mine, we still are not at all the same shape. Enter the Duct Tape Dress Form. The always-gracious Composer spent an hour yesterday wrapping my torso in three layers of duct tape over an old tee shirt. While it was fun to look like a space warrior from the future, about halfway through I started to panic (a little claustrophobia). Visualizing and keeping the scissors close by helped. We cut it off up the back, placed it over Lucille, and taped it back together. Now when I sit down to sew I've got the coolest sidekick ever. The holiday festivities continued today with a big lunch in honor of Head Coach, my younger brother who was in town briefly. Of course he was travelling with Mrs. Head Coach and his son and daughter, but we were surprised to meet Mrs. Head Coach's cousin's son who was with them. He is a sweet four-year old boy, and I mention him because his name is actually Lawyer. I couldn't make that up. His family is having a rough patch so my brother and sister-in-law have him for a long visit. Lawyer! We had a big ham, new potatoes and green beans, salad, whole wheat rolls, and raspberry jello. Whenever we have a big casual group I am so grateful for my restaurant dishes. These were my mother's brilliant idea back in the mid-80's. We eat off these plates every day, and I have about twenty of them. They are thick but not coarse, cream color with a wide pale green band around the outside, and unbreakable. We got them at a fabulous called Johnston's Salvage. This place was a giant Quonset hut filled to the brim with disorganized junk. A determined seeker could find lots of salvaged restaurant ware there. I've got Buffalo china bowls, saucers, serving platters, and dinner plates. Some of them we had to literally dig out of the ground outside, where they were displayed on and under tables. And had been for years. None cost more than a dollar. Sadly Johnston's is no more, but my plates will never die. Christmas was lovely. We had our fancy, junky dinner on Christmas Eve with grandparents here and lots of presents. The notable present of the day was Daisy's "Orsie" big enough to ride on. She immediately named him Joe, then stuck a toothpick up into his nostril as a ritual piercing. Christmas morning was wonderful and peaceful. We had told the children not to get us up before 6:30, and at 6:30 on the dot they knocked on the door. It was just getting pink outside, and Giles had lit a roaring fire. So nice! They all liked their presents and were polite, so the Composer and I were happy. We ate Clara's fantastic Double Cranberry Coffeecake and drank cocoa--Daisy was barely stopped from pouring cocoa into the tiny open mouth of her new baby doll. After church and Christmas dinner, Daisy and the Composer hit their naps, the Composer having spent several late nights making Christmas happen up in the studio. Then came my favorite part of Christmas, the afternoon hike. We've been doing one for the last five or six years. This year it was very cold (Daisy is not a fan of the cold outdoors and her nose immediately turns bright red. She also does a most convincing shiver.) But the light was beautiful, the colors of the woods were rich and subtle, and Felix walked right up to a heron on a pond which flew just inches from the ground in an arc both awkward and graceful, which was a perfect end to a holy day. We had such a peaceful, pleasant day today. This morning I did all my prep cooking for Christmas Eve and Christmas dinner. Then Daisy went down for a nap, and Giles and I took a long walk, with a treat--the Composer picked us up after forty minutes, so we got to walk all downhill and flat the whole way, no going back up the mountain! When Daisy woke up, her diaper was dry, so half for fun and half because my mother thinks she is ready for toilet training, I set her on the big potty and turned on the sink tap. Success! She completely understood what she was supposed to do and did it immediately, then was all business about the toilet paper, potty lid, and flushing. So proud of herself! 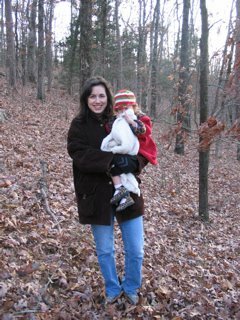 After *that* big event we went to the nature trail between the lake and town, so Felix could birdwatch and the Composer could run, and the girls and I could hang out on the playground and send Daisy down the slide. That was excellent for her. After dinner I suggested the potty again and once again, she hopped up, did her business, and looked around for applause. I think she is on to something. Time to get serious about Christmas food! The Composer is German and loves German food, so we do a German Christmas dinner. I love this menu, it is so easy! And we all love eating it; I never cook these things during the rest of the year. Spaetlze are a flour dumpling that you squeeze through a spaetzle-press, which is similar to a potato ricer. I used to make the spaetlze from my actual German cookbook. This dough was insane. It took the strength of three strong men to press through the gizmo. I switched to the recipe in Joy of Cooking. A baby could press those: so much better. The Christmas Eve menu is a little trickier. It walks a fine line between actual good food and white trash-type selections. The hot dogs in sweet and sour sauce are a given, and they definitely pull us toward the trashier side. But men and children love them! And I think that when they were instituted in the early 70's they were a little more cutting edge. This is the strangest, saltiest meal we eat all year, and it is so fun! Everything that can possible go on a skewer or a toothpick does, and the fondue pot is a must for the hot dogs. Maybe we're too picky when it comes to Christmas cards, but every year it seems like there are fewer good ones out there. I don't want Santa. I don't want "Seasons Greetings" or "Happy Holidays". I want classy, but not fancy. Not cartoony, not silly. 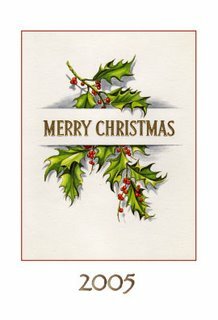 This year in a stroke of good luck combined with modest genius, I found a perfect vintage Christmas card at the antique mall last month. Dated 1962, it is everything I have ever wanted and only cost fifty cents, and the Composer kindly scanned the front image and added the year to it. I just hope I get them out while it still actually is 2005! 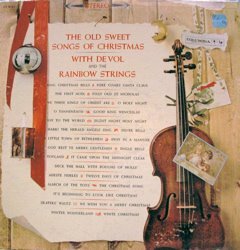 Frank Devol and the Rainbow Strings: Christmas doesn't get any more fabulous than this! The Composer brought this vinyl album home from his dad's--it was a staple of his childhood Christmas memories. He transfered it to CD for us so that the Sweet Sounds of Christmas can fill our pad with holiday cheer. Eating by the seasons makes good sense for many reasons--it's cheaper and things taste better when you eat them near the time they're grown. I've seen lists of what you should buy when, but I find that common sense works well enough when I'm cruising the produce department. Fruit: The fruitbowl on my kitchen island at this time of year holds oranges, Granny Smith and honeycrisp apples, and pink grapefruit. The tiny Clementine tangerines get their own bowl--they are so delicious and easy to eat that they are our favorite winter fruit. Vegetables: We have something cruciferous almost every night in cold weather--broccoli, cauliflower, kale, or cabbage. Sweet potatoes, potatoes, and winter squash get roasted several times a week. I'm trying to remember to add other root vegetables; we like parsnips roasted, and I think everyone will eat turnips. Moms often tell me their children won't eat this or that. To that I can only say "Hmm." I find that my children generally eat what they are offered, and I make sure and offer lots of seasonal produce. They get used to it. My brother Josh bought a new house in town and yesterday was moving day. The Composer and the big kids worked all day, along with friends and other family. 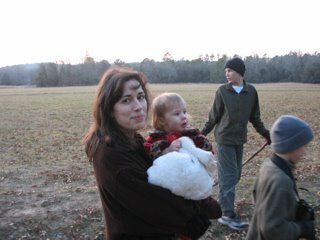 My mother and I got off easy--we stayed here with Daisy and cooked and cooked. First we made two peach pies (with peaches I had frozen this summer), and she made a big pan of Deep Dish Apple Something--it had a bottom crust and a crumb topping. Then we started browning chicken. Twenty pounds of chicken and a huge skillet of mildly curried tomato sauce later, we put an enormous pan of Chicken Country Captain in a slow oven to cook for several hours. Chicken Country Captain is a Southern dish with an odd name. It has curry powder and raisins in it, is served over rice, and tastes comfortably like something that would have been an adventuresome conversation piece in the 50's. We served 14 hungry people the chicken, a huge pot of rice, baked butternut squash, a lovely salad, and French bread. And pie. And a mountain of chocolate chip cookies. Josh owes us. 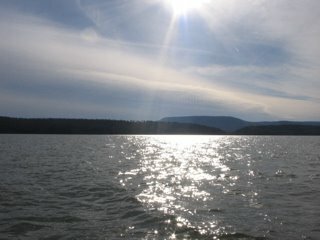 In honor of Felix we took an afternoon boat trip at the state park, looking for bald eagles on the lake. 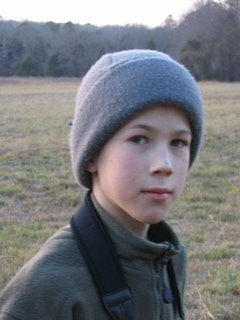 We scored--we saw their nest, and a big juvenile sitting in a tree. Fortunately all the children had their brand new ski gear, as it was VERY cold. Daisy had graciously consented to remaining at home and napping with the Composer. As soon as we settled on the party barge Felix began chatting up the park employee leading the expedition. They had matching bird guides (the gold standard Sibley's), and spent the trip comparing notes on excellent birds they had seen and hoped to see. We were blessed with a never-ending supply of various ducks, cormorants, pelicans, vultures, and an unforgettable flock of thousands of snow geese which all took off from the water at once, all honking together, their white wings flashing in the afternoon sun. Daisy and I practiced being home all by ourselves as the rest of the family was in the big city buying ski gear with Grandpa. A test run for when everyone else actually does go skiing in January, leaving the two of us to our own devices. Fortunately for me, she is great company and great to kiss. An occasional slow day is a very nice thing. I finished my skirt, did a little Christmas shopping, an extra baking of bread, made a cake, started a new batch of fruitcakes, and finished some paperwork. The house is very, very quiet with everyone else gone. A nice place to visit, but I don't think I want to live there yet! 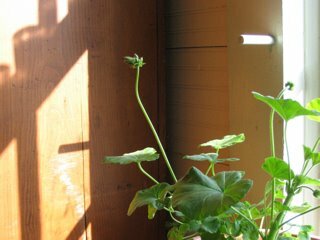 This summer's geraniums, brought into the house in October, continue to flourish in this east-facing window of the dining room. I think I will be seeing flowers soon--look at those buds! Last week I sewed for the girls again, a flannel dress for each from my old favorite Butterick See & Sew 4099. 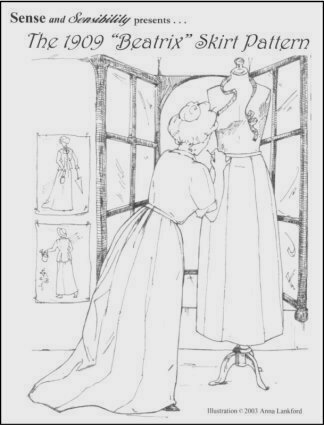 This time I lined the bodice of each with flannel for extra warmth, and drafted a long sleeve by extending and expanding slightly the short cap sleeve cutting lines. I also added bias bands at the wrist (since both dresses were plaid--I love plaid on the bias!). They are very cosy, practical, and comfy. 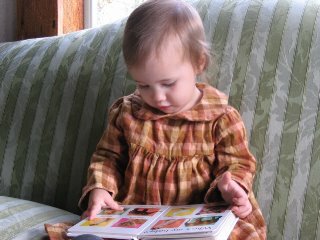 I had enough scraps from Clara's dress to make up a little matching dress for Daisy--it's a tan, gold, and pink plaid. Her sleeves I completely invented since I didn't have enough fabric for anything else, but I love how they turned out. 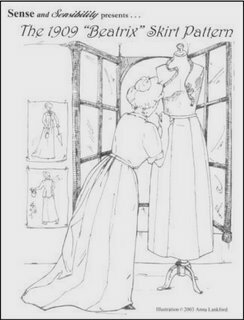 I also started the Sense and Sensibility 1909 Beatrix Skirt which I have made up before and enjoy. I'm using a *bright* red wool woven which my mother gave me--it has a wonderful drape. This is a fun pattern to put together, with its nine gores. Feels elegant to wear, also, especially in a comparatively heavy fabric. We had such a cold snap that I was frozen out of my sewing room, with its two drafty doors facing east into the wind, and gazillion old single-glazed windowpanes that I wouldn't trade for anything--so for a few days I had my sewing stuff set up on the end of the dining table. So messy! I truly appreciated being able to move my stuff back out of sight into its rightful place, in the sunshiney, drafty sewing room. Today was tree day at last. We like our tree to reach to the twelve-foot ceiling, so there is no stopping at the grocery store parking lot to buy one from Kiwanis--they just don't have anything in our size. Instead, the Composer headed off in our old pickup truck with an axe and Giles, Felix, and Clara, and was back in twenty minutes with a perfect, graceful cedar that just touches the ceiling. My father has an odd streak of Make Do-ism that has not always served him well: e.g., we never owned a Christmas tree stand. Why should we when five-gallon pickle buckets were so cheap? In an annual ritual my brothers and I were sent outside to fetch large rocks to stuff around the trunk of the tree, down in the bucket. This system never failed to result in a tree that was leaning, tipping, or planning to tip while we were at church. Watching this with horror every year, I assumed that Christmas tree stands were exorbitantly expensive, and never aspired to own one myself as a young wife. 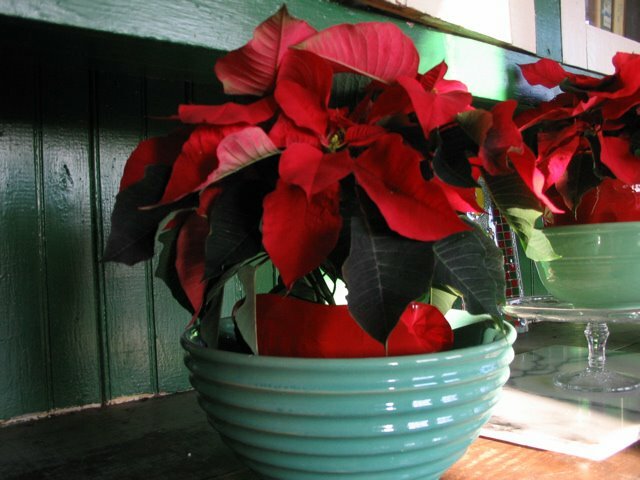 However, our first Christmas, the Composer casually brought one home from Wal-Mart. I have since learned that they don't cost all that much money, and am grateful every year when he brings it out and puts up the tree. It's not completely painless, but I don't have to provide any stones, and I like that. Today we finished about half of our cookie baking for Christmas. When I was a teenager, my mother did elaborate gift baskets for a long list of people, so the baking was a really, really big job. It seems so piddly now to do only three or four kinds, but that is plenty for us. I haven't been giving lots of cookies away in the past years because it seems like there are way too many sweets circulating already. So we make the things we like the very best of all, and enjoy them at home and with guests. *Rugelach: cream cheese pastries rolled around homemade jam, chopped walnuts, sugar, and cinnamon. *Virginia Breedlove's Afternoon Delights (from the Dairy Hollow House Cookbook--best ever! ): a thin layer of brownie, topped with minty green buttercream, glazed with chocolate. *Spicy molasses cookies cut out and decorated, of course. We save this batch for last and take a whole afternoon for decorating. So much fun! Snow is such a treat here, and we got half an inch last night. 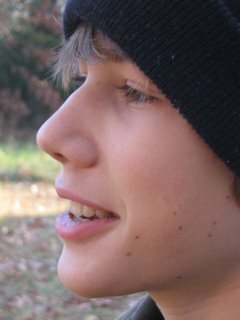 Felix planned ahead to give himself a snow day and did all of today's schoolwork yesterday. So smart. Giles headed out with the camera this morning and got some lovely snowy photos. 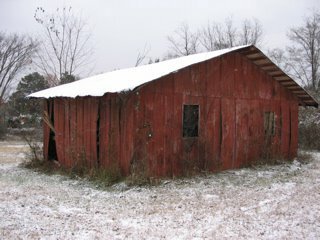 This is our very old barn which my father put together thirty years ago out of the original tin roof of the schoolhouse. In its heydey it housed a large milk cow named Candy, a family of Mexican burros, and assorted banty hens. Now it only shelters the tractor which the Composer uses for bushhogging, but it still lends quite an atmosphere to the pasture, especially in the snow. Which is why travel was on my mind yesterday! My next younger brother (we'll call him Head Coach) took his high school football team to the state finals in a state that takes its football very seriously. We couldn't miss that game, so the seven of us plus my mother drove the 450 miles to see his team play. We had a wonderful time, and although the game did not go well, it was more than worth the drive to see him, Mrs. Head Coach (actually Cheerleading Coach), my niece and nephew, and the team. My mother brought along a tin of pecan tassies she had made--tiny pecan pies. That's some good car snacks! It was very nice having her along as she put herself on non-stop Daisy-entertaining duty. The Composer did all the driving, so all that was left for me to do was pass out cookies and borrow Giles' iPod. 1. Leave the house tidy. Easier said than done, but if your kids are like mine, they will be milling around ready to get in the car substantially sooner than the adults are ready to go. Take this formless energy and harness it--send children to pick up rooms, wipe surfaces, gather trash, and put laundry away so that you can step back into a peaceful, welcoming house. 2. Think ahead about food. Must-haves to return to: at least one fresh, crunchy vegetable in the fridge (carrots, sturdy romaine lettuce, red peppers, etc.) and the makings of a pantry supper--eggs and bacon, pasta and sauce--not so much because you will be hungry (we eat constantly in the car while travelling! ), but because you and your family will want something that tastes like home. 3. Immediately gather the dirty laundry and start a load. Nothing will make you feel more in control of your re-entry. Also, all your boy's jeans will be dirty. So will Soft Blankie. 4. Ignore the answering machine. Unless there is some urgent question that has been hanging over you and knowing the answer would be less stressful than continuing to wonder. 5. Empty the car. Again, this is a biggie, but so nice to have done. The Composer is always on this job at my house, and I appreciate it so much. And no leaving the piles in the front room. Use that child labor and get things put away! 6. Do whatever will make you feel better. Travel is tiring--being away from home is draining, driving hundreds of miles with a nursing baby can be challenging, and a carful of big children, however well-behaved, can leave you feeling weary. Once your homecoming business is taken care of (see above), do whatever it is you've been missing. Exercise, go for a walk if it's still light, sit with a magazine, take a bath. Oh, I'll take all of those option, thanks. And bring me a hot water with lemon, please. Clara has been playing on her new cello for about a month. She had been playing on a half-size instrument and then suddenly it was so outgrown! To the great dismay of our cello vendor, we skipped the 3/4 and 7/8 size cellos and went straight to the full size. She is doing beautifully on it. 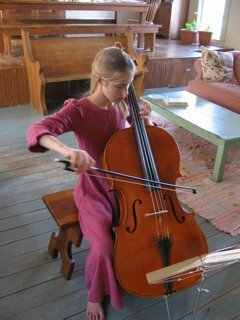 Here she is working her way through the Prelude of Bach's First Suite for Unaccompanied Cello--a truly beautiful piece. Her endpin has drilled a little hole in the living room floor. I live happily with imperfections in my home, because that state of affairs means that I don't have to be bothered by things like holes in the floor! Last night was the semi-official start of the Christmas season: the Christmas Parade. Fortunately it was cold, so after dinner we bundled up in our coats and hats--Daisy looked like visiting Russian royalty in her red polarfleece coat with leopard-print trim, and knitted hat with a piecrust frill. Main Street was very crowded, but we found a spot in the back of my colleague Bucky's pickup truck, with a good view. Three marching bands, many floats, and at least a dozen convertibles with beauty queens--Little Miss County Fair, Teen Miss County Fair, Deaf Miss County Fair, Petite Miss Butterfield, etc. The marching bands caused Daisy some very big eyes. We came home frozen and satisfied.